Rambling Moose: Dice.com - Was your redesign an April Fools Joke? Boy do I hope so. Yes, a rant on someone's design of a web page. I hope to find out that tomorrow (the day of posting for this) the changes have gone back to the old "condensed" view.... it wasn't. When ever you change a web page, you will annoy someone. In this case www.dice.com annoyed me. 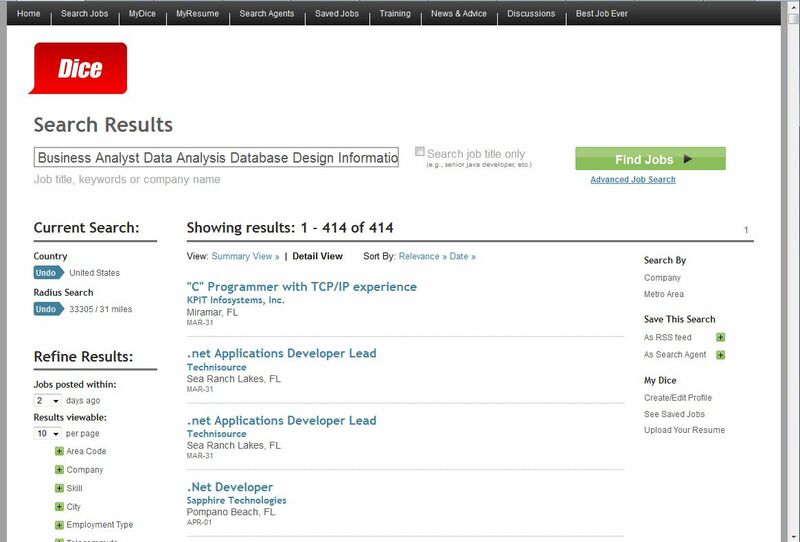 Don't get me wrong, Dice.com is a great service for job searches if you are looking for technology, but this last redesign says to me that they are not looking at the actual "useability" of their data. After all, the site really is just producing a database or a spreadsheet for you to read. There's a simple solution, the old format was much more useable. This one was obviously written for people of restricted vision since everything is BIG. In the course of every morning, my ritual is once I settle in, I look at 160 web pages. The vast majority of those pages are on one of five different job search webpages. 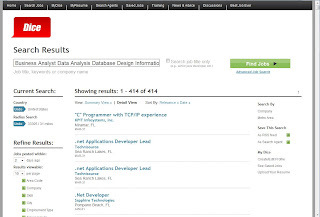 www.Dice.com, www.Monster.com, www.careerbuilder.com, www.indeed.com, and www.simplyjobs.com are the five that I hit the most, but there are others. It takes me a minimum of three hours to go through all of this, every single day. Weekends I have an added 160 pages to go through of very tailored searches of many cities, companies, the state and more. Anything that slows me down is not allowed. I take the page that I am looking at, break it up so that it can be bulk loaded into tabs, and split all of the web pages into five sets each for the Daily search, and the Weekly search. I tried using the RSS Feeds for simplification but for the vast amount of what I am doing, they're just not showing enough data. They cut off, for example on the view above, somewhere in the "I" positions. I need the rest, so I have to do it through the web interface. This morning, after experiencing at least five April Fools Jokes on websites that wanted to waste my time with things like games to place an order, or blinky things where normally data would reside, I finally hit the view above. That was my first Dice page. Notice that there are 414 results. Not all of them are pertinent, however I allow for a little extra "slop" so I can include those that may not be strictly within my field. My field is Project Management, but that should be taken broadly. I have six years experience developing web sites under three different disciplines, Joomla, ASP Classic, and Google Sites. To make a long story short, I can spot a badly designed website in an instant. This redesign left me with the opinion that their team of developers and especially the person who approved the change should be forced to "eat their own dog food" by being unemployed and have to look for work in a large geographic area. I'd suggest Siberia but that would be cruel. To the Siberians that is, its tough enough to live in that climate than having these new people bumping around. 414 results. The old design would have in a line columns for each individual job advertisement, and you could sort on the columns. Very easy to skim over those 414 jobs and place them in just the order you found the best. The link that I had to load this page, early in the first set of five for the daily job search, is very long with many parameters that specify where I am, how far away, companies to exclude, job titles to exclude and so forth to make this an automatic process. Now, the sort is gone, the summary/detail link does not work, and it's broken on Firefox and Internet Explorer on three different PCs here in the house. I was confronted with this ... slop before I had my second mug of coffee and said some very rude things. I decided to think about it and am writing this late in the afternoon... why? Take a good look at that picture. You will notice that there are exactly four positions on that page. When I paged downward, the inflated font and the layout allowed me all of eight positions to decide on. Eight. Out of 414. Are you kidding me? Now, a large font could be excused. I can make it larger or smaller to fit my needs by doing a ctrl and + or - (minus sign) in Firefox. It's easy to get around that. The problem next is that they decided to slam all of the data into one column. Now, not only can you not sort it easily by loading it all into Excel (Yes, I am also a Data Analyst), but they took away all the handy little sorts. You can sort by date which is useless for my purposes - I only care if the job was posted since the last time I looked, or something nebulous called "Relevance". I have never used "Relevance" since it has no bearing on what I am doing... yes, Relevance is Irrelevant. In fact it's also pretty much irrelevant on any website I've ever seen it including leading eCommerce websites but that's a different story. After clicking on the sorts and trying to change it to make it more useful by going from "Summary View" to "Detail View" and getting absolutely no difference... I gave up. I was beat. Now, Dice which was one of the more friendly to view and search for large metropolitan areas with many positions open, has become a burden of sloth. I have enough searches in Dice that the morning Job Search now takes an hour longer. 2) Fire everyone who approved this slop. 3) Don't do it again. 4) OK, I'll say it... hire me, for a lot of money preferably ... I can telecommute from South Florida and tell you when you're making a mistake. In fact... that is just what I have done, for free.